Feeling secure and relying on your door locks to keep you safe inside is a good feeling unless of course, you are in a room full of people and there is an emergency that leaves a potentially panicked mass stampede of those all trying to find a way to exit the building at once. 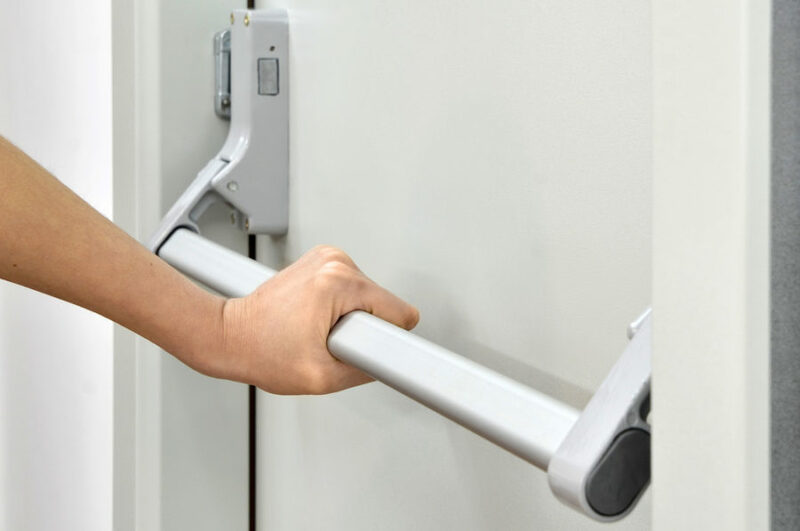 This is the moment you will be thankful that your facility adhered to the legal requirements and recommendations to install panic hardware on their egress, exit, doors to make it easier for everyone to get out safely. When is panic hardware required on exit doors? with specific high-traffic or high-hazard occupancy, such as educational or assembly facilities with more than 50 people. Some examples of high-hazard facilities include rooms that run equipment with more than 600 volts or more than 800 amps, boiler, incinerator, refrigeration machinery, or furnace rooms as well as some electrical rooms. The idea behind panic hardware is to allow a way out of the building in the case of an emergency. Panic hardware cannot be used on a fire door because of the danger of trapping people inside during a fire. Sometimes, panic hardware is called fire exit hardware, or they may be referred to as egress doors. Basically, if a door doesn’t have a lock with a push/pull or a latch, the door is not legally required to need panic hardware. Though, just because you may not be required by code to install panic hardware on your door, you still have the option to do so. If your building is required by code to have panic hardware in place, you will need to understand what all this entails. The type of hardware you use is important. The actuating portion of the exit device needs to be at least half the width of the actual door. It should not require more than 15 pounds of force to unlatch it. You should never add a chain lock, padlock, an extra deadbolt, or any electric latches or components that would delay the opening of an egress panic hardware equipped door. If you use a touch pad, it must never extend more than half the width of the door, starting from the side with the latch. Depending on your location, your panic hardware may be required to meet testing standards to withstand a tornado or hurricane. One common characteristic of most panic hardware is that it has a dogging feature. These dogging features allow the latches to be held in a retracted position in order to create a push/pull function. When the device is dogged, it is unlatched or unlocked, and you will be able to pull the door open. The touch pad the most common style for modern buildings. Flexible when an electrified option is required. The crossbar usually will be used for glass doors, but the electrified options are limited because of the lack of space. Recessed panic hardware will require a cut out in the door but will reduce the projection of the hardware from the door. There are a couple of types to use depending on whether you have one door or a pair. These types include Rim or Mortise. The Rim device is mounted on the surface of the door, whereas the Mortise is installed inside the door with the panic hardware mounted on the face of the door. There are also Vertical Rod/Cable or Multi-Point options. The Vertical Rod/Cable style is usually used on pairs of doors. The Multi-Point combines vertical rods with a Rim device to allow 3-point latching. Once you decide on the functionality of your panic hardware, you will be able to select from trims, controls, and a variety of finishes. In some cases, you can also choose to add Electric Latch Retraction ELR. Not all buildings are required to have these type of exit devices, but some choose to install them regardless for safety sake. These legal requirements are often revised, but you can always stay up to date by first referring to the latest information provided by The Life Safety Code NFPA 101 as well as the International Building Code IBC. 2006 and 2009 IBC requires panic hardware on egress doors in educational and other buildings with 50 or more occupants. 2000 and 2003 IBC requires panic hardware on egress doors in educational and other buildings with 100 or more occupants. NFPA 101 is the Life Safety Code encompasses high hazard occupancies with 100 occupants or more. Are you looking to install panic hardware on your doors? For more information, give Denver Experts Locksmith a call 24/7 at (303) 309-7906 today. We will be happy to help serve your door hardware requirement needs.